Actors Matt Damon (right) and John Lithgow ’67 had a spirited discussion at Sanders Theatre about their craft during a session that kicked off Arts First, the University’s annual spring celebration of the arts. Damon is this year’s recipient of the Harvard Arts Medal. Harvard’s 21st annual Arts First festival kicked off Thursday afternoon at Sanders Theatre with a spirited conversation between actor Matt Damon and regular master of ceremonies and fellow actor John Lithgow ’67. The lecture hall and performance space was jammed with members of the Harvard community who turned out to hear Damon and watch as Harvard President Drew Faust gave him the Harvard Arts Medal. Damon grew up in Cambridge and spent three years at Harvard before the lure of Hollywood pulled him away. But the former Lowell House resident and Cambridge native, who was active in Harvard’s theater scene during his student days, put his Harvard experience to good use along the way. “I am really proud to come from here,” said Damon, who described his ongoing ties to the area and to Harvard, and his sense of loss at the Boston Marathon bombings. Damon told the young crowd that he has tried to honor and live up to his Harvard roots and the University’s broad mission throughout his life, and he urged his listeners to do the same. “Hold onto that, and that feeling of what we are really about here,” Damon said. Like most people, Damon said he struggles with failure, admitting that he suffers when a project he has put his heart into doesn’t strike a chord with either audiences or critics. But he tries to understand how “something didn’t work here.” He also turns to his wife for support, he said, and for her total honesty. The conversation also touched on issues concerning family, acting, and Damon’s philanthropic work. He founded the nonprofit group water.org, which helps to provide access to safe drinking water and sanitation in Africa, South Asia, and Central America. With his work, he said, he hopes to be able to “engage people and help them understand what’s going on???? as a way to solve problems. With Arts First under way, what promises to be a memorable and mischievous performance of the first movement of Ludwig van Beethoven’s Fifth Symphony with conductor and Harvard Professor Gregory Mankiw will open the festival’s performance fair on Saturday afternoon. According to a press release from Harvard’s Office for the Arts, Mankiw, in addition to being a renowned economist, is “regarded in some circles as one of the foremost interpreters of Beethoven.” In the run-up to the event, Harvard luminaries have been praising the New Keynesian specialist’s talent with the baton in a series of sidesplitting YouTube videos. Mankiw, the Robert M. Beren Professor of Economics, will conduct the undergraduate Charles River Ensemble at noon at Harvard’s newly revamped Science Center plaza. Attendees should keep an eye out for a special appearance by Lithgow — watch for a limousine — and for some high jinks by Harvard’s Hasty Pudding Theatricals. 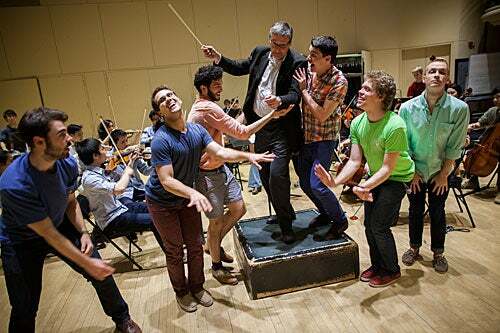 On Wednesday afternoon, Mankiw rehearsed with the music ensemble and members of the famously raucous and racy theater troupe at Lowell Lecture Hall. While conducting the group, the slightly stiff-armed but surprisingly nimble economist ducked the embrace of an amorous “woman,” dodged a cartwheeling dinosaur, and ended up in a Rockettes-like dance number. Other highlights from the three-day event will include the first collaboration among Arts First, Harvard Medical School (HMS), and the Harvard School of Dental Medicine (HSDM). As a classically trained pianist, HMS student Christopher Lim ’10 was an active member of Arts First during his Harvard College days. When a member of the newly formed Committee on the Arts and Humanities at HMS approached him about organizing a group of Harvard medical and dental students to participate in the festival, Lim didn’t hesitate. “Being on a separate campus, it’s very easy to forget there is a whole University dedicated to the pursuit and study of so many other things,” said Lim, who helped coordinate two nights of music performances, film screenings, dance, and visual art presentations (one on Thursday evening at the Longfellow campus and the other in Cambridge on Saturday afternoon) for this year’s Arts First. Like so many people who were stuck at home in the Boston area during last Friday’s regional lockdown, the director of the Dudley orchestra was monitoring events as they unfolded and feeling restless. Then he started thinking about ways to give back. “Now is when people want to help and make donations, and I just thought it would be a good idea to turn this concert into an opportunity to do that,” said Aaron Kuan ’09, adding that the theme of universal brotherhood in Beethoven’s Ninth delivers an uplifting message at such a difficult time. Harvard Playwrights Festival in Farkas Hall, three evenings of staged readings of plays created by students as part of an advanced playwriting class. “We often do this out-loud reading of ‘Beowulf’ for fun because we love the poem, so we thought: ‘Why not have it be almost a lead-in’ ” to the A.R.T. play, said Harvard College Fellow and medieval scholar Steven Rozenski.